Which would you prefer to experience? Remember the magical feeling of being a child on a merry-go-around at your neighborhood park?!? Imagine it. What does your body feel like? Your feet are planted firmly on the metal floor. You’re balancing your feet as best you can between the raised, embossed circles about the size of a half-dollar. You feel the tension in your hands as they are gripped tightly on the cold (or hot!) metal railing (depending on the season and temperature that day, of course), your fingers tingling. Your head is proudly held high, with your hair whipping around you, hitting your eyes and mouth. Or… maybe your head is tilted downwards and your eyes tightly squeezed shut. What do you hear? Your own voice as it screeches loudly “FASTER! FASTER! FASTER!, other kids on the swings giggling, the freight train horn as the train barrels down the tracks. What do you smell? The familiar neighborhood scents…the local hotdog and beef stand’s wafting aromas, the bouquet of freshly cut grass. What do you taste? The sweetness of the milk chocolate bar you took a bite of before you got on the merry-go-round. What do you see? If you are squeezing your eyes shut, then you likely see blackness or if your eyes are open, you may see a kaleidoscope of colors as you whirl around and around and around. Can you imagine it? Now, what do you think was on your mind as you rode the merry-go-round? Do you think you were worried about tomorrow’s math test? Or judging yourself that you mistakenly grabbed mismatched socks this morning? Or that you were still holding the grudge against your big sister who wouldn’t take you shopping with her? I doubt it. Because you were being mindful. You were in the present moment. You were using your five senses, non-judgmentally to experience the world, as if nothing else mattered for that moment. So, what IS mindfulness? And why would I want to know about it? According to Jon Kabat-Zinn, Professor of Medicine Emeritus and creator of the Stress Reduction Clinic and the Center for Mindfulness in Medicine, Health Care, and Society at the University of Massachusetts Medical School, “mindfulness is the awareness that arises by paying attention, on purpose, in the present moment, non-judgmentally. Yes, I am talking about the Mindfulness you are hearing a lot about now. Yes, I am talking about those Mindfulness practices of coloring books you are seeing on TV commercials, as a best-selling product on Amazon, and recently featured on both NBC Nightly News and The New York Times. Yes, I am talking about the Mindfulness practices that has its roots in the Buddhist culture and other Eastern introspective spiritual practices as well as contemplative prayer in Christianity, but is not a religious practice. When one practices Mindfulness, you are strengthening your “awareness muscle”; doing so helps to improve management of racing thoughts, distressful moments, anxiety, depression, physical pain. 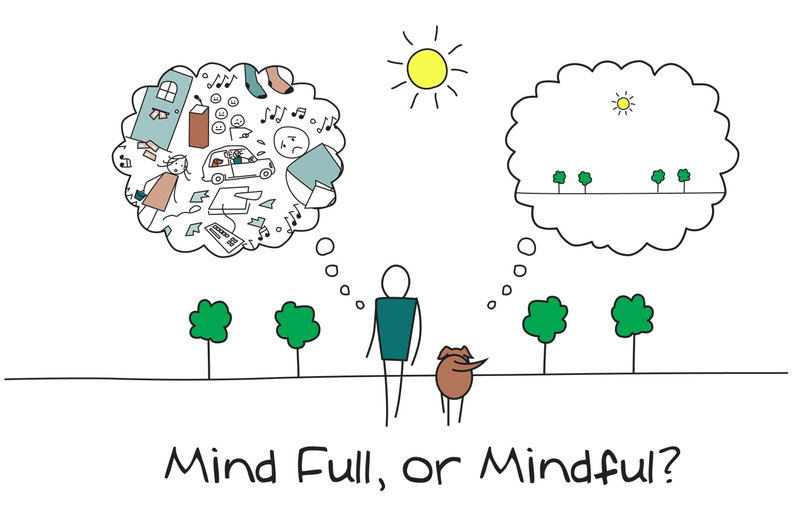 Mindfulness is one of many skills identified to help one “manage” (not control!) these difficult emotions, sensations and realities of life. It’s about increasing your enjoyment in everyday life too. While mindfulness practice takes many forms, a common practice is mindfulness of the breath coupled with diaphragmatic breathing. Typically, the participant sits comfortably with eyes closed and directs their attention to the physical sensations of breathing by simply noticing it, paying attention to it, and being aware of it. When they begin to notice thoughts, emotions, physical sensations or external sounds that distract them from the focus on their breath (and this WILL happen! ), the participant is encouraged to accept them, allow the recognition of these stimuli to come and go without judging or getting involved, and return to following their breath. Hundreds of research studies have been conducted to scientifically measure the benefits of mindfulness on physical and psychological health. Research results suggest that practicing Mindfulness awareness can help improve one’s ability to improve sleep, regulate emotions, improve performance for those with attentional issues, improve relationships, improve empathy and insight and promote healthy immune functioning. Have you ever felt like the world was spinning around you at a warped rate of speed and all you wanted was for it to stop? Learning and practicing Mindfulness skills could be helpful in changing this distressing experience. While in therapy with me you will learn new skills to manage “life on life’s terms”. You will learn the skill of Mindfulness, which is a skill that has become one of the “best practices” in the management of difficult emotions that can be obstacles to living a quality life. Mindfulness is also the core skill in Dr. Marsha Linehan’s Dialectical Behavioral Therapy (DBT), which is a more comprehensive cognitive-behavioral treatment approach that you will also learn to incorporate into your day-to-day management of difficult emotions. DBT, like Mindfulness practice, has been shown through research studies to change behavioral, emotional, and thinking patterns associated with problems in life. Through the modules of Mindfulness, Distress Tolerance, Emotion Regulation and Interpersonal Relationships, you will learn and practice healthy and helpful skills that replace unhealthy and unhelpful thought and behavior patterns that have been “well practiced” throughout your lifetime and that contribute to stress, chaos, emotional dysregulation, physical ailments and unhappiness. Although you can learn DBT skills in individual therapy, participation in group therapy is the customary way for individuals like yourself to learn and practice these skills while feeling validated that “you are not alone” in your struggles. Waterford Counseling and Psychological Services is offering “DBT-Lite Groups” beginning this fall. If you are seeking a supportive therapeutic environment where you would like to improve the quality of your life by removing unhealthy and unhelpful thought and behavioral patterns, give Waterford Counseling and Psychological Services a call. Our group of compassionate and educated professionals look forward to teaming with you to help improve the quality of your life.